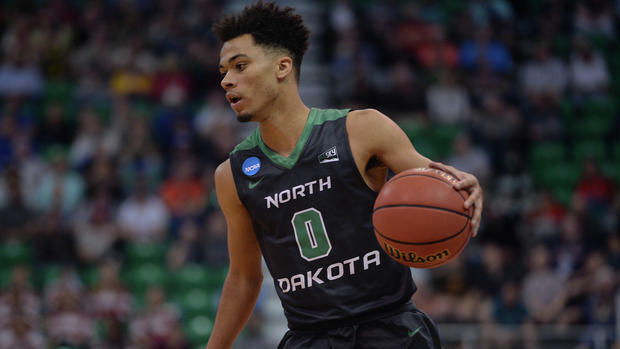 Former North Dakota and DeLaSalle guard Geno Crandall’s phone has been blowing up with texts and calls lately since he’s one of the biggest names left on the transfer market this summer. Crandall, a 6-foot-4, 180-pound senior, announced last week he was leaving UND and would play his final college season elsewhere. The Minneapolis native told the Star Tribune on Friday he has five schools as favorites, but the list of suitors continues to grow. The Gophers aren’t the only Big Ten school interested in Crandall. He said Maryland and Nebraska recently contacted him, along with other programs such as Georgia Tech, DePaul, Boston College and Grand Canyon. Going to high school only couple miles from Minnesota’s campus made it easy for Crandall to stop by for an unofficial visit last week. He’s also been working out and playing pickup basketball with the Gophers several times this summer. So does Minnesota coach Richard Pitino have an advantage to land him? Crandall, who won a state title at DeLaSalle as a senior in 2014, said his next visit could be to Colorado State next week. He was coached in high school by Rams assistant and former Islanders head coach Dave Thorson. Crandall was also working Friday on setting up visits to Xavier and Gonzaga this month. Pitino granted senior center Matz Stockman's request to transfer this week after graduating. That opened up a scholarship for Crandall to join the team in 2018-19 as a potential impact player at point guard or off guard. Now it's up to the former Minnesota prep standout to decide if he wants to return home and play for the Gophers. As an All-Big Sky performer last season, Crandall averaged 16.6 points, 4.3 rebounds, 3.6 assists, 2.1 steals (led the league) and shot 41.7 percent from three-point range as a junior for the Fighting Hawks.